Before the arrival of the railway in 1861 Nonington had, like many other parishes in Kent, butchers, bakers, cobblers and cordwainers, grocers and tailors and an assortment of other trades supplying the needs of the local people. In the 1830’s Nonington residents, especially the shop keepers, could have goods brought from London by a regular service sea via Sandwich. 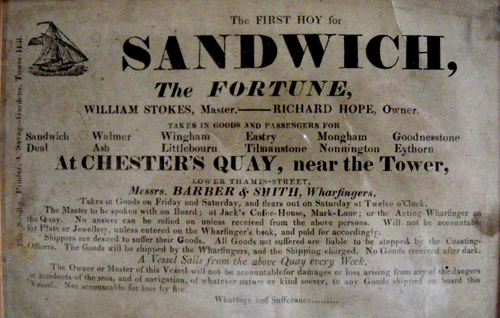 I was fortunate to recently find a copy of a hand-bill for“The first hoy for Sandwich” which advertises a service departing every Saturday from Chester’s Quay, near the Tower of London which took in “goods and passengers for Sandwich, Walmer, Wingham, Eastry, Mongham, Goodnestone, Deal, Ash, Littlebourn, Tilmanstone, Nonnington, Eythorn”. Those Nonington residents who wished to could therefore also keep abreast of the latest news and fashions from London. Some craft businesses gradually declined as the railways made it easy to obtain cheap mass produced clothes, shoes and household items, but people still needed to eat and the grocers prospered as cheap tinned food became readily available for sale due to increased industrialisation and cheaper transport costs. As the twentieth century progressed he grocers in turned declined as mechanized road transport enabled large shops and stores in Canterbury, Dover and Sandwich to deliver directly to rural customers. The opening of the Co-Operative Store in Aylesham in the early 1930’s affected smaller shops in the surrounding villages and hamlets. I can remember that in the late 1950’s and early 1960’s the present parish of Nonnington had Hogwood’s shop by the church, Mrs. Gilham’s opposite the Baptist chapel with Mrs. Dyson’s chemist shop just up the road. 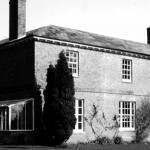 Mr. Clayson ran the Post Office, general store and newsagents on the junction of Easole Street, Oak Hill (Vicarage Lane) and Holt Street, and Mrs. Pilcher ran The Lodge Stores by the Fredville Park gate in Holt Street. 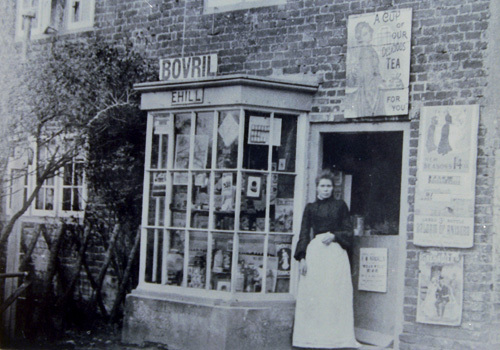 The Co-op delivered directly to customers, taking orders on a Monday and delivering on the following Friday, and Lipton’s of Canterbury offered a similar service. Bread was baked and delivered directly by Mr. Best from Adisham, and fresh fish could be bought on a Thursday. Milk was delivered early every morning by Abbot’s Bros. of Canterbury from the dairy next to the church, now Church House, and the Co-Op also offered a daily milk delivery which was paid for by Co-Op milk tokens. There was also a coal delivery service run by Messrs. “Bill” Clarke and “Walt” Garlinge from their premises at ‘The Haven’ in Vicarage Lane. This is a brief record of some of the small businesses and shops which could be found in the parish of Nonington over the years.